Even though I knew there was only two weeks until Christmas… it hadn’t sunk into my brain yet. Then Friday it dawned on me. Yikes! The amount of work I need to get done this week. 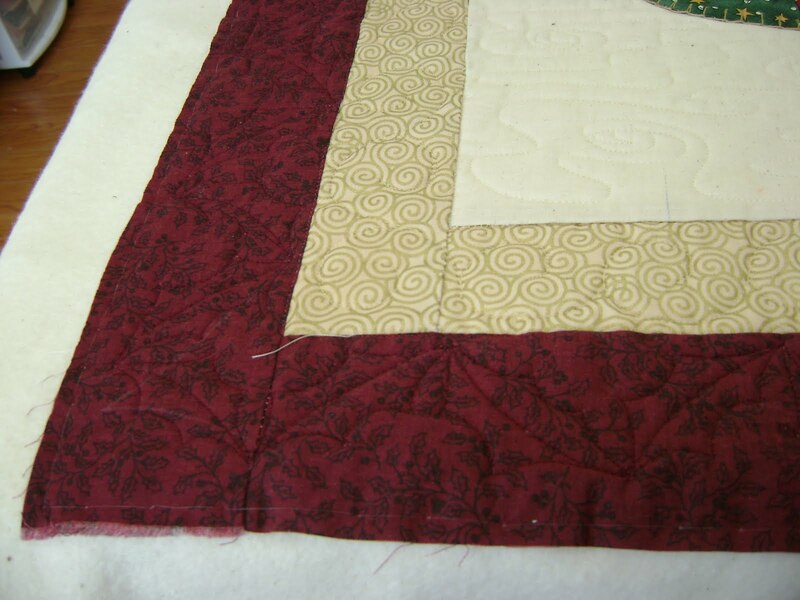 Quilts to finish. Closet doors to paint and get re-installed. New floor to be installed in the bathroom. (It finally arrived at the installer.) Plastic window covers and window quilts to finish and get put up. Christmas gifts to wrap and hide. (But where?) Yup, it’s gonna be a very busy week for me. My daughter has “Mom’s busy, busy” radar. Somehow she knows exactly when I’m busiest and then needs a babysitter. She had to work Saturday so Ladybug got to stay with me all day. Here is the next quilt finished. Folded in half it barely fit on the intake table. It hangs off the far end and off on one side. It’s 110 X 130. In the background of the blocks I did a wind meander. 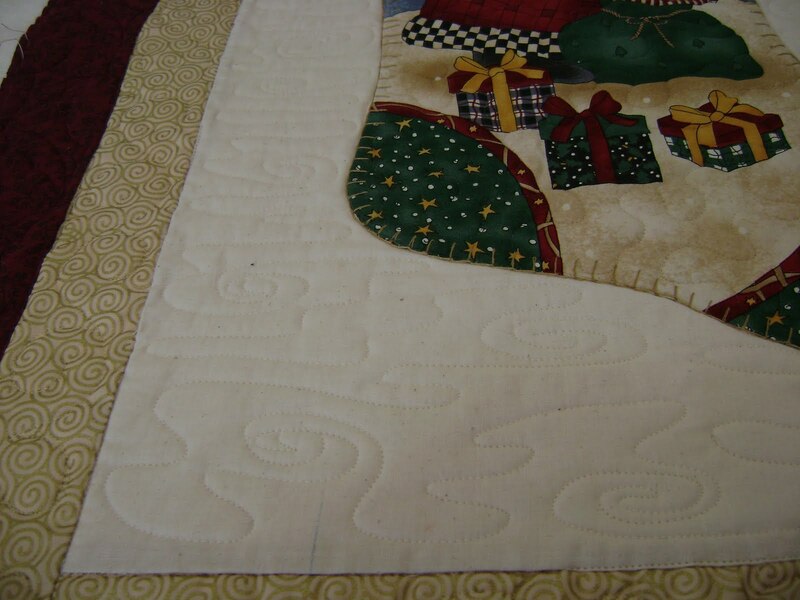 On the outside border and the sashing strips I did holly leaves. On the inside border I did a curly design. 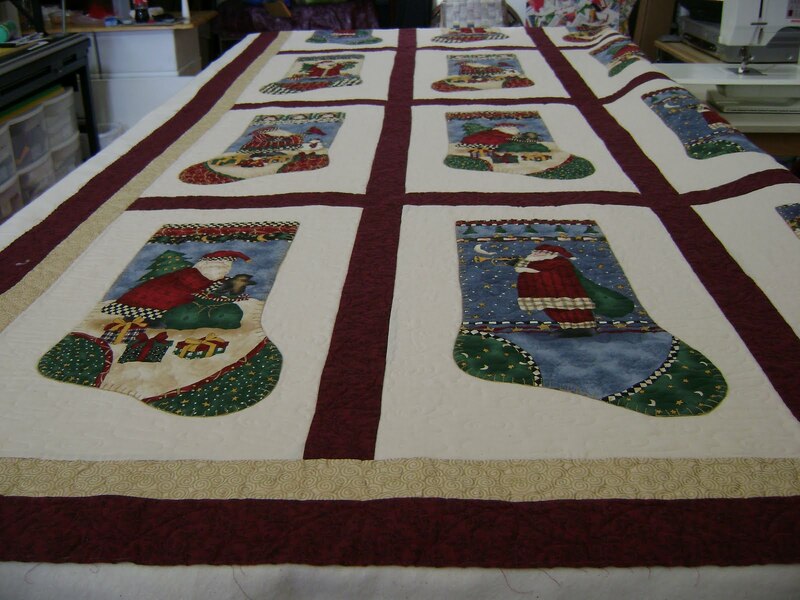 On the Stockings I did a plain meander with mono thread. Here’s a view of the back. The tiny holly leaves are the corner stone blocks of the sashing strips. 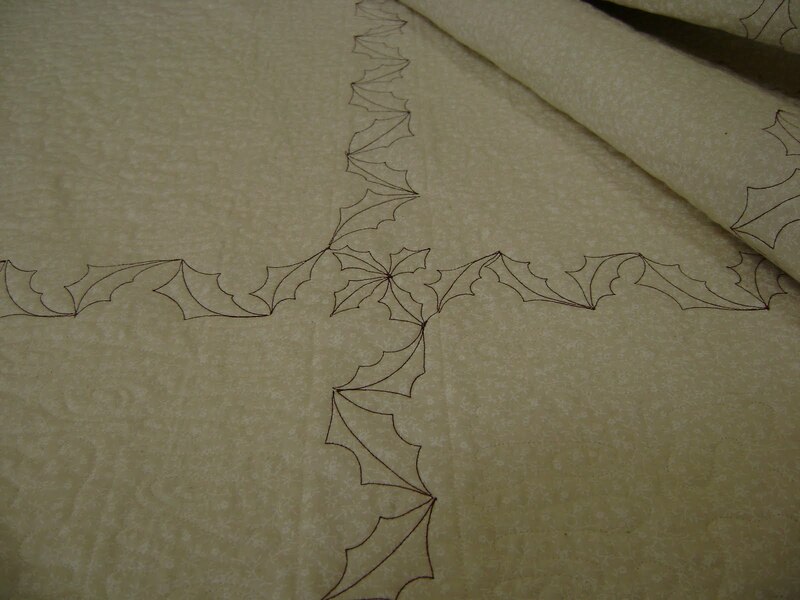 This shows the holly leaves around the outside border and the curly design of the inside border. I soooo agree with you Kathi, Yikes is the word of the week. I say it a lot these days. YIKES is the word of the week I think. and there is always a “life interruption” when one is the busiest. That's one of “the rules” you know. Remember, if it NEEDS to get done, it gets done. And if it did not get done. Well, must not have been needed. right? Atleast that is my “Christmas attitude” story and I am sticking to it!! 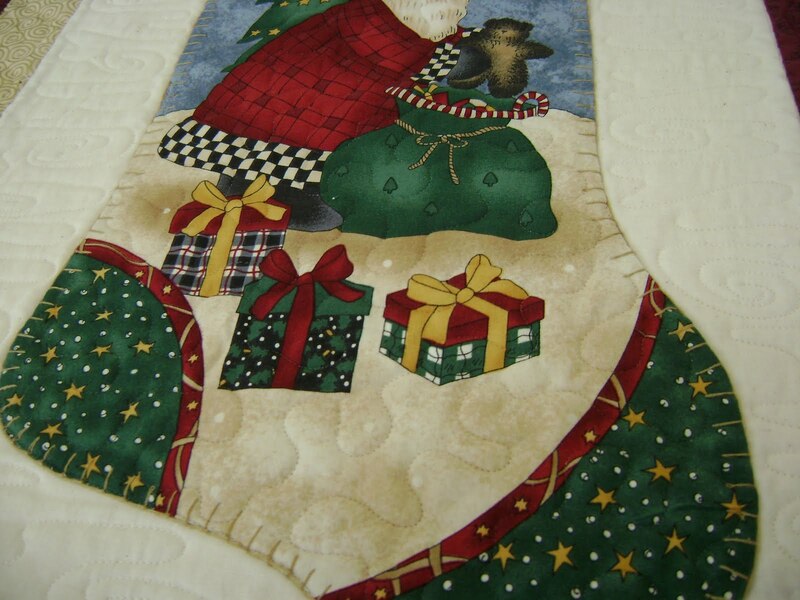 This entry was posted on December 7, 2009 by Anita in Customer quilts 2009, QUILTS - CUSTOMER and tagged Custom machine quilting, Custom quilting, Customer quilts, Longarm machine quilting, Longarm quilting, Machine quilting, Quilter for hire, Quilts.